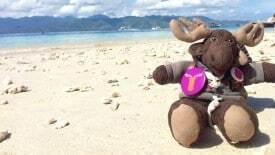 Globejotting Travel Mascot Sven Wondermoose always loves serving as a placeholder image when it involves sitting on a beach in Bali. Choose a time. The available times should show up in your time zone, and the calendar will tell you what time zone you are scheduling in. If the time zone appears wrong, please let me know! For writer coaching, if you don’t need to talk for a full hour (for example, if you’re paying for an hour that includes 30 minutes of my reading / critiquing time beforehand, and 30 minutes to talk), please still book a 60-minute time slot. I offer coaching via Skype, FaceTime, Google Hangouts, and phone, as well as writing critiques via e-mail. If you live in or will be passing through Ho Chi Minh City, I also offer in-person coaching at my office in District 7. Once you book an appointment, you should receive an e-mail right away from Calendly ([email protected]). You should also receive a personal e-mail from me within 24 hours. If you don’t receive a confirmation from Calendly within an hour, and another from me within 24 hours, please e-mail me to make sure your booking worked.